at the end of term, pupils from the local aberdeen secondary schools who hoped to attend art college in the following year would visit on one particular day to receive a pep talk from one of the senior lecturers and be given a guided tour of the premises. no doubt keen to demonstrate their suitability in the eccentricity stakes and how easily they would fit into the surroundings, many wore particularly flamboyant clothing. disappointingly for them, the majority of bona-fide art students wore far more pragmatic apparel consisting mostly of t-shirts and jeans, the latter often inadvertantly decorated with paint, clay and printer's ink. 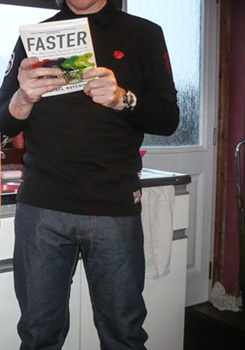 sartorial elegance was never knowingly on the menu. once the journeymen of practical clothing, in those years jeans could be had in two basic flavours: straight leg and flared. and inevitably several inches longer than was sensible, meaning about six inches of wet denim covering a wet pair of trainers when it rained. and it quite often rained in aberdeen; it probably still does. 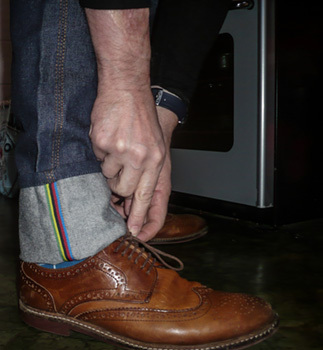 i am insufficiently well-versed in contemporary fashion to know whether denim jeans still hold an assured place in the modern mind, but it has not escaped my eagle eye that one or two cycling apparel providers have concerned themselves with recreating jeans in their own image (so to speak). denim is an inherently heavy material classified by its thickness and an unfortunate ability to hold onto precipitation like a sponge. neither of these features are particularly endearing to an eager cyclist. however, not all jeans are created equal, and not all jeans necessarily inhabit the rarefied atmosphere of technical fabrics and saddle friendliness. cheshire's meccanica offer a rather admirable pair of jeans, inscrutably branded 'bollenium' and unashamedly offered to the cyclist about town. despite an overlapping seam in the crotch region and my subjecting them to a brooks saddle, the fit made them quite suitable for brief commuting runs and not as uncomfortable as originally thought. according to meccanica's colin ball "The jeans are not 'cycling jeans' per se. They are our classics that are OK for cycling with a generous crotch fit (on purpose) but not 'technical.'" the fit is rather good, though the 30" waist reviewed still needed a belt to keep them up. i've no idea if the legs are rather long on purpose, but they do allow the luxury of rolling them up a few inches to display a thin line of world championship stripes along the inner seam. nobody in the office noticed, but they were probably too busy last year when the british team were all climbing off. denim jeans are frequently matched with team jerseys; you need only cast an eye over the feed stations at most professional races to notice that. 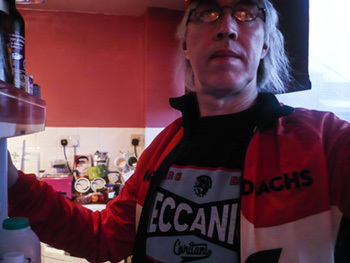 however, it seemed far more perspicacious to ally the dark denim with other off the bike offerings from meccanica, such as their basic polo, cycle top polo and a good old fashioned toolbox t-shirt. despite the meccanica logo, augmented in many cases with the word coritani, being a contrived invention, it manages superbly to avoid looking as such. on the t-shirt, a thick 100% cotton affair, it looks distinctly old-school yet modern at the same time. the ideal apparel for bike fettling and recovery days. the cycle-top, despite appearances, isn't in fact, a cycle top at all. constructed from the same heavyweight cotton fabric as the basic polo shirt, it offers a single pocket to the right rear and a quarter length zip in place of three buttons closing a stylishly high, round collar. 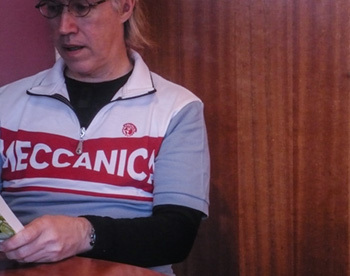 the short sleeves and lower two thirds are coloured light blue, with a white on red meccanica logo separating this from the white top section. neither baggy nor tight, you could conceivably cover several miles clad in this top before the rest of the peloton noticed the difference. the basic polo is anything but, in my opinion. a classic fit formed yet again from 100% cotton, the regular polo style collar meets those three buttons to complete the bradley wiggins/scott mitchell look. the secret test as to the fit of any polo shirt is by how many buttons require to be unfastened in order to pull it on over your head. 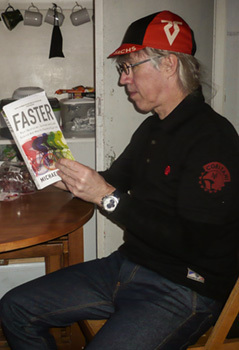 the meccanica shirt passed this test with accomplishment. the question is, of course, why anyone would now enter the cycling apparel battlefield at all, given that its population seems intent on making individual pickings rather slim. unless, that is, you have a unique selling point as your less than secret weapon. in the case of meccanica this could just be that all their clothing is made in the uk, a factor that offers much to applaud. backing up that usp with sound style, design and quality as well as targeting cyclists in their downtime strikes me as a strategic ploy geared towards success (did you see what i did there?). occupying the chesterfield sofa in debbie's clad in any of the above would identify me as a non-civilian, yet keep that identity hidden from civilian eyes, if you catch my drift. ideal for lounging about after a heavy day in the workshop or on the training camp.